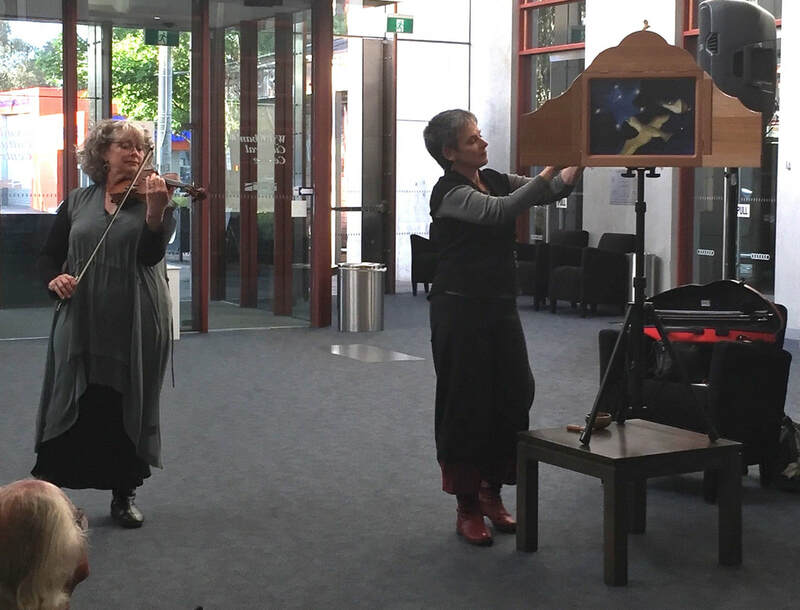 Storyteller Jackie Kerin (R) tells a Story from the Flyway, illustrated by her kamishibai, a traditional Japanese storytelling ' picture theatre', accompanied by Sarah Depasquale's eloquent violin. Marguerite Brown, from her opening speech for the Overwintering Project at Wyndham Art Gallery. 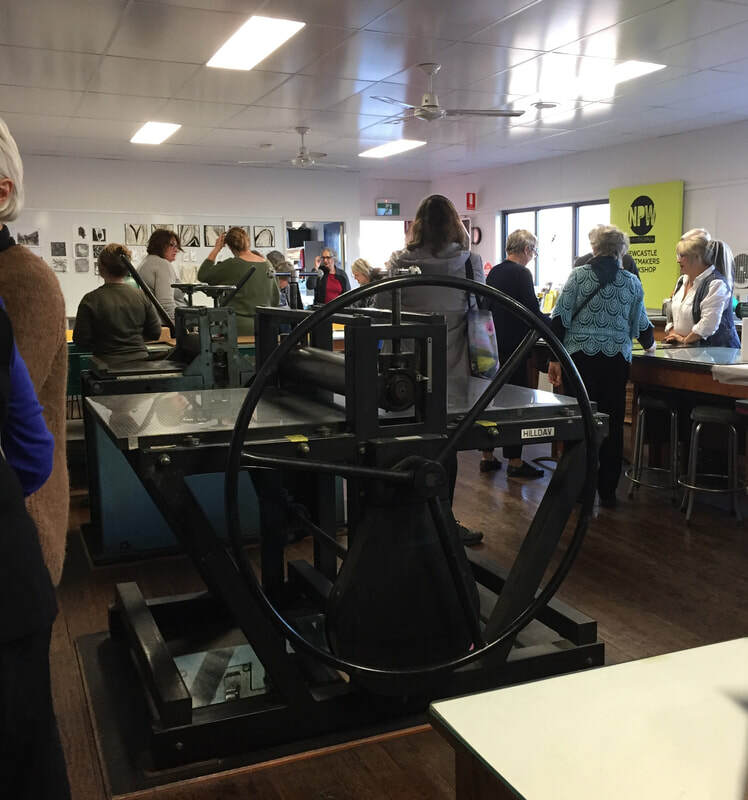 The second core exhibition for 2018 was opened by General Manager of the Print Council of Australia, Marguerite Brown, and Master Storytelling duo Jackie Kerin and Sarah Depasquale. The opening was well attended despite terrible weather! The Overwintering Project Print Portfolio was exhibited alongside the beautiful collaborative artist book, Overwintering, by members of Melbourne's Firestation Print Studio and Brisbane's Migaloo Press, as well as works by Cathryn Vasseleu, Kate Gorringe-Smith, Heather Hesterman, and local artists Sue Anderson, Rob Mancini and Robyn Fry. The gallery also commissioned sound artist Byron Scullin to create a site-specific soundscape for the exhibition. The Wyndham Art Gallery runs over two floors. 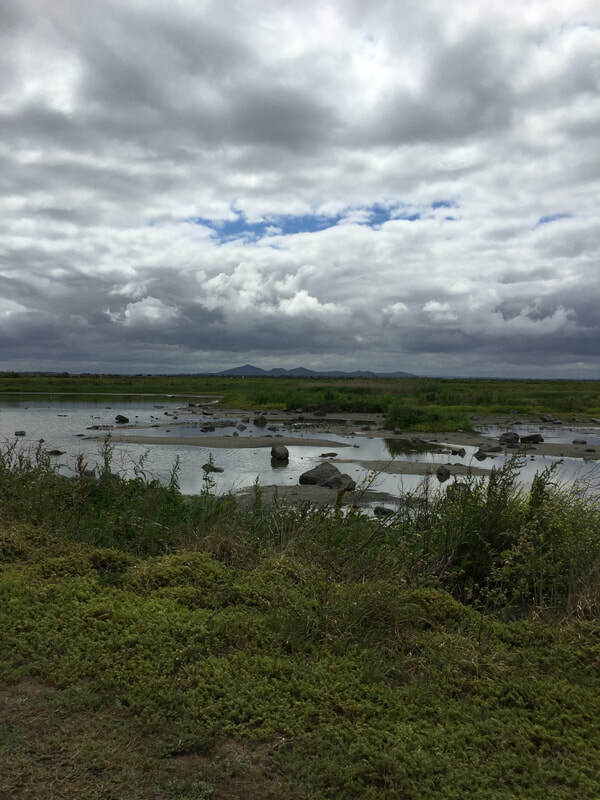 Upstairs, Byron Scullin's soundscape, created from the calls of birds found at local shorebird haven and Ramsar site, the Western Treatment Plant, played, bringing habitat into the space. 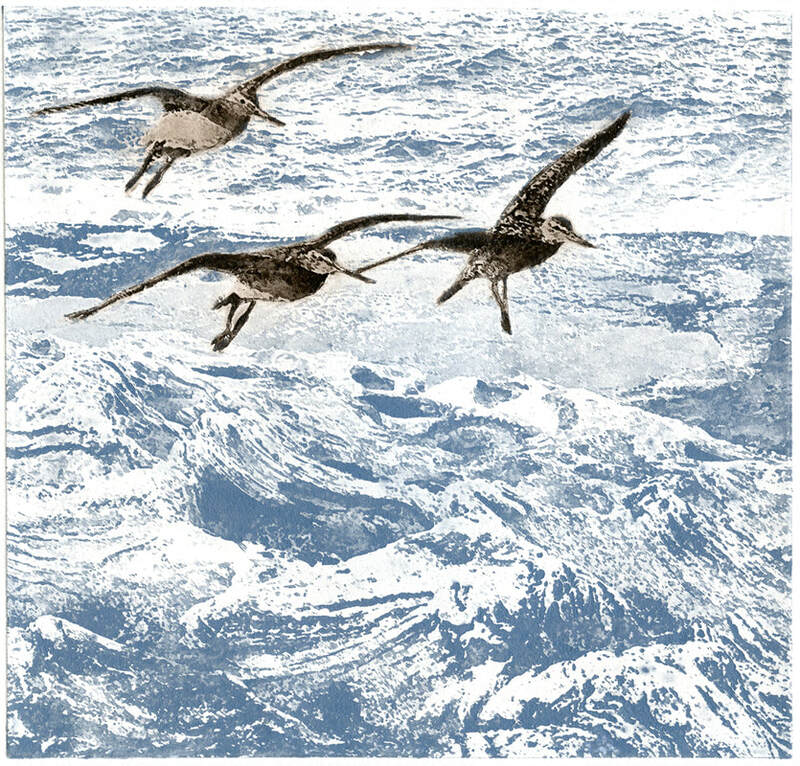 This was beautifully enhanced by Cathryn Vasseleu's ten-minute video of shorebirds on Darwin's Lee Point, As If One Bird, (below left) that Cathryn created especially for the Overwintering project. The video was projected onto an entire wall of the upstairs gallery, and could be seen as one walked about the space. 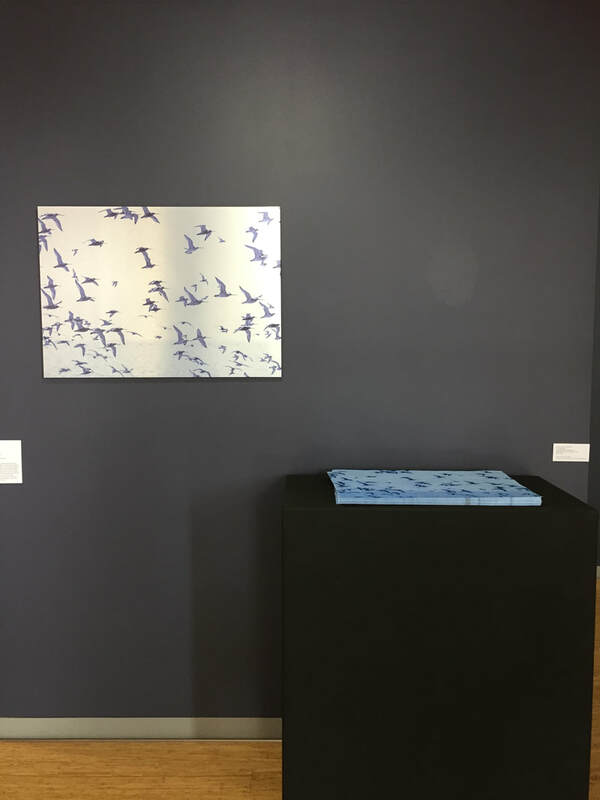 The Overwintering artist book made a wonderful centrepiece, while Heather Hesterman's flock of godwits printed on aluminium referenced the human-made environment through which they travel, and her stack of digital prints (which gallery goers were invited to take), were both a gift and a poignant reminder of the ongoing attrition of species (below right). 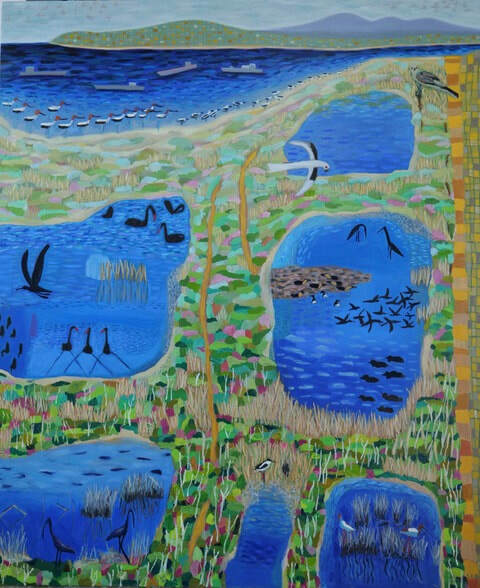 As visitors entered the Cultural Centre, which houses the gallery, their first glimpse of the exhibition was Sue Anderson's amazing painting of the Western Treatment Plant (pictured below left), a refuge for many bird species only ten minutes from the gallery. 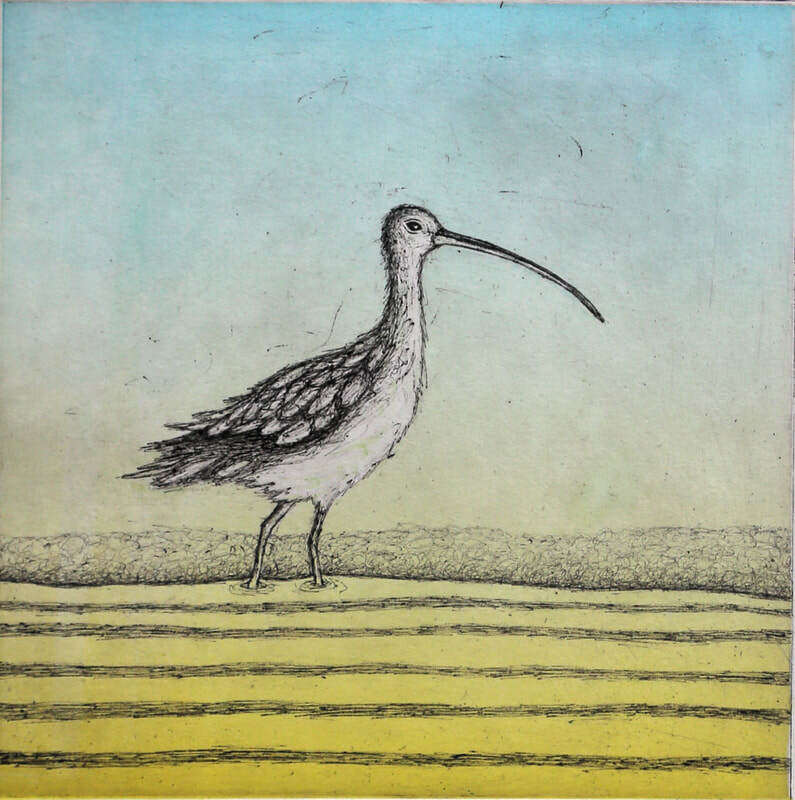 Rob Mancini is a local artist and birdwatcher. 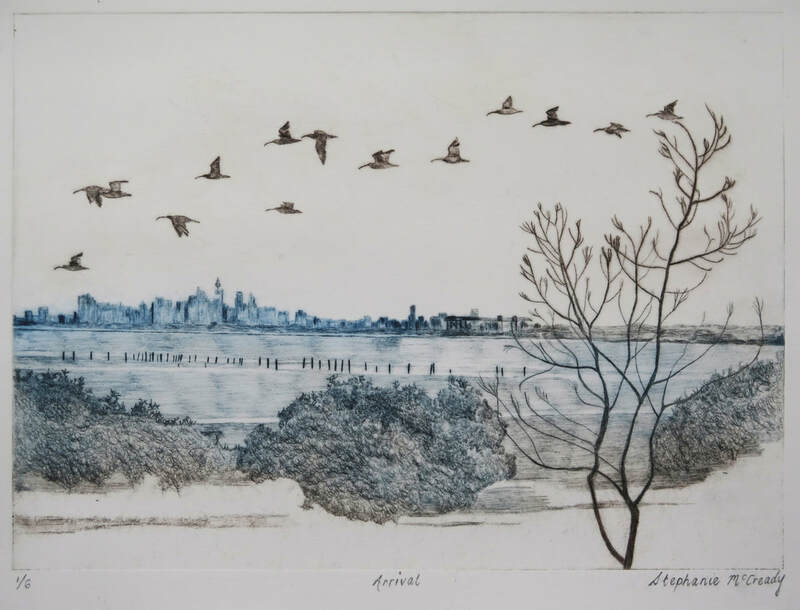 His paintings of shorebirds against urban textures also conveyed the challenges our shorebirds face as the urban encroaches upon their habitat (below right). Over the duration of the exhibition we ran three bus bus trips from the gallery to the Western Treatment Plant so that people could experience the birds and the kind of habitat depicted in the prints of the Portfolio. 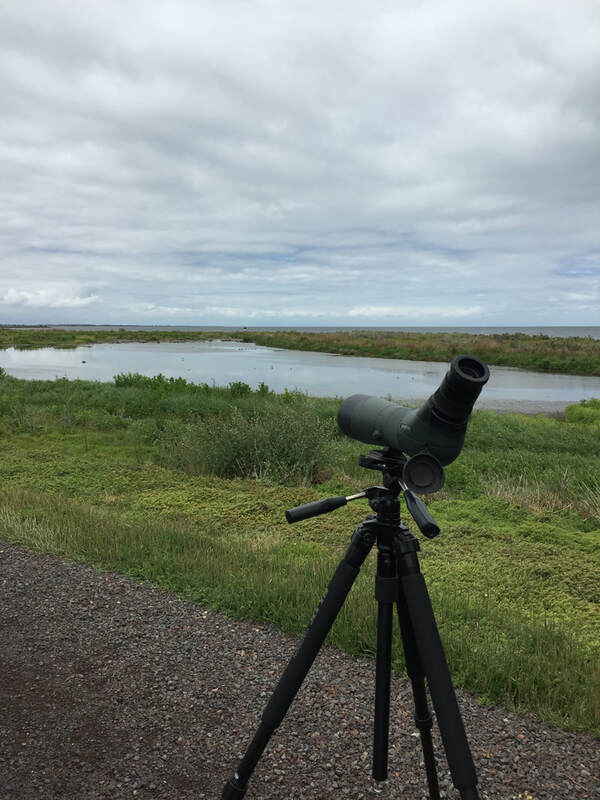 These were attended by shorebird experts Penny Johns, Dr Danny Rogers, and Roger Standen, and participants were thrilled to see the actual birds in their local habitat. The gallery also ran an artists talk and a workshop, both of which were well attended. Imprint editor Andrew Stephens wrote a wonderful piece for Melbourne's newspaper, The Age, which was syndicated in numerous other national newspapers, which brought visitors flocking to Wyndham. Curator Megan Evans said that she thought our show was the best attended they had ever had! 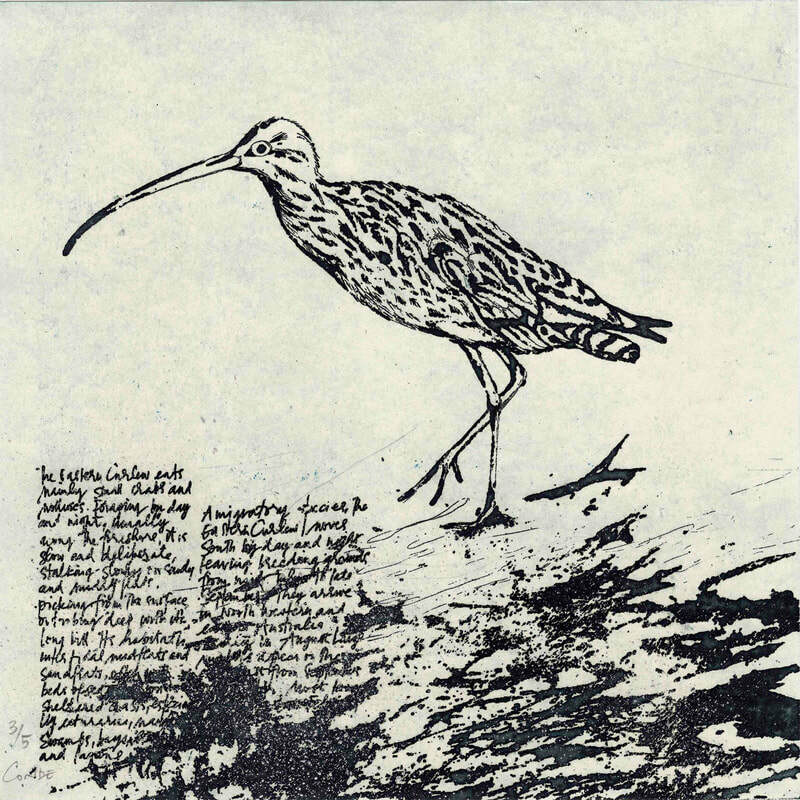 I also spoke to Eddie Ayres on Radio National's The Hub, and was joined by Victorian Wader Studies Group chair, Roger Standen, and Migaloo Press artist, Jennifer Steurzl in speaking to Myf Warhurst on 774. 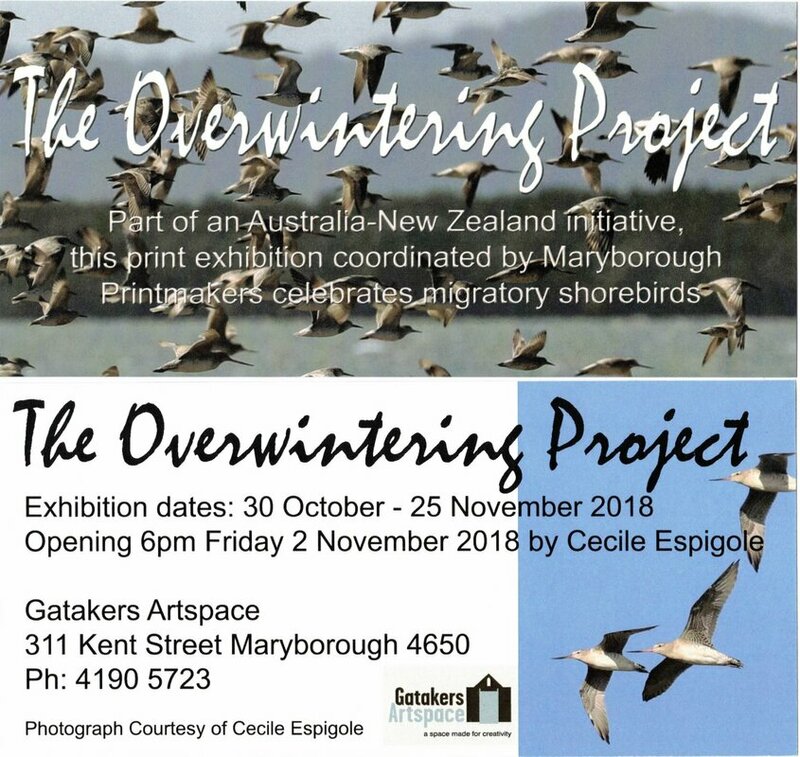 I would like to say a huge thank you to all the artists who encouraged me and made work, and to all the other friends of the Overwintering Project who have brought together such beautiful and moving exhibitions throughout 2018. Below are installation images of the Overwintering project Print Portfolio. 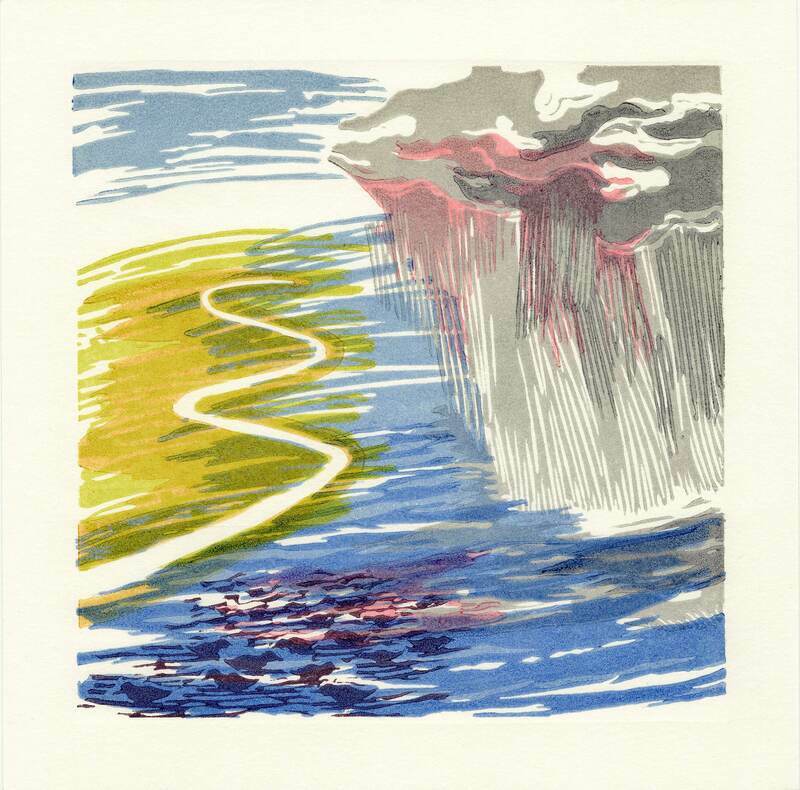 The top right image also pictures the Firestation Print Studio-Migaloo Press collaborative artists' book, Overwintering. Clockwise from top left: World shorebird authority Dr Danny Rogers and exhibition visitor Sarah Coffey on a gallery-run tour to the Western Treatment Plant; landscape at the WTP with spotting scope set up! 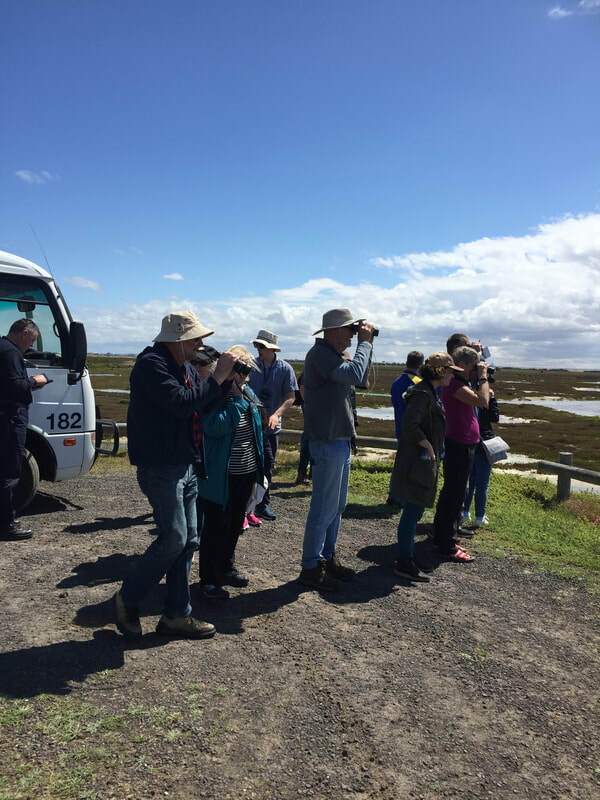 Roger Standen, Chair of the Victorian Wader Studies Group leads another tour (he his the tall central figure with hat and binoculars! ); bottom left - the bird haven that is the WTP. Overwintering along the shores of the Great Sandy Straits off the coast of Southern Queensland has many advantages for shorebirds visiting this part of the world. The Straits are situated between Hervey Bay in the north, along the Mary River estuary and the mainland shoreline just north of Rainbow Beach. Fraser Island makes up its eastern boundary. The Straits are very tidal and wide sandbanks bordered by extensive mangroves provide a mostly safe and extensive habitat for the migratory birds - unlike parts of Hervey Bay, where the birds often compete with human and canine disturbance. It is in this region that many of the Queensland artists have sourced their subject matter for the exhibition. 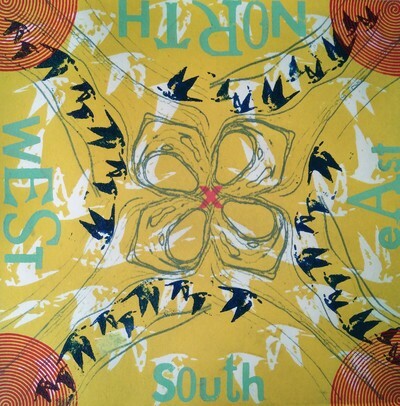 Interstate artists have sourced material from their respective regions. 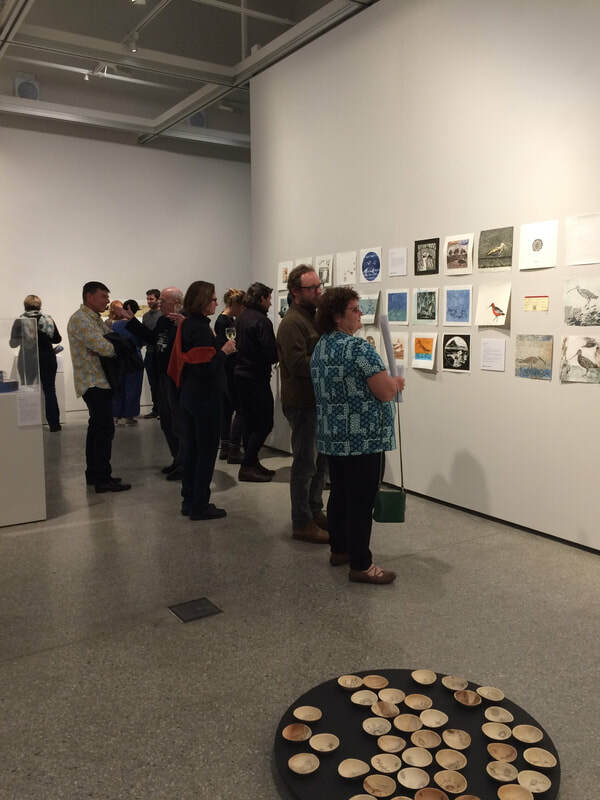 The exhibition featured prints, artists books, assemblages, small sculptures, textiles and ceramics. 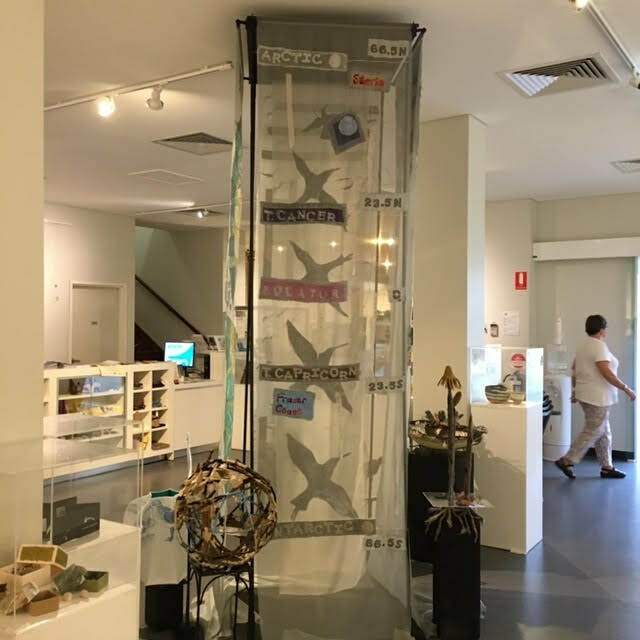 Fractured Habitat, the centrepiece of the textile installation, was made up of 4 sheer panels (one each by artists Vicki Worland, Kim Ende, Rhonda Simonis and Chris Evens), enclosing a central panel of birds in flight. 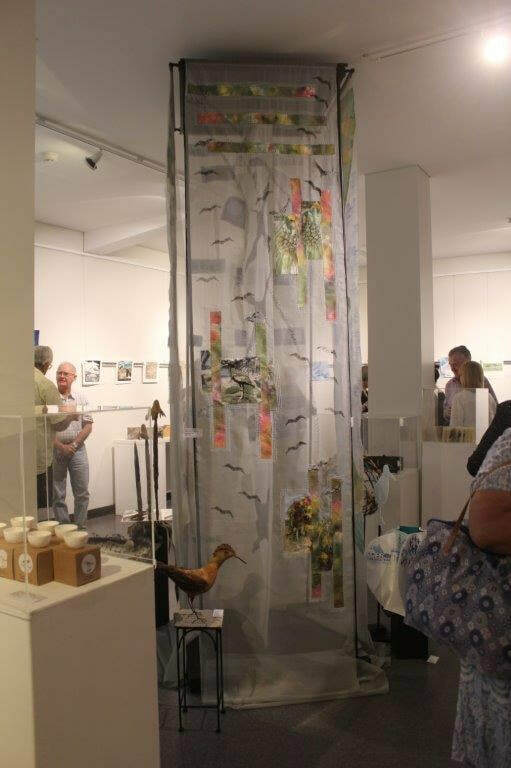 Maryborough artist Ann Brown put together a Sway presentation of the exhibition which you can see here. Below: A selection of images from the exhibition. 27 Albert Road, Moonah, Tas. 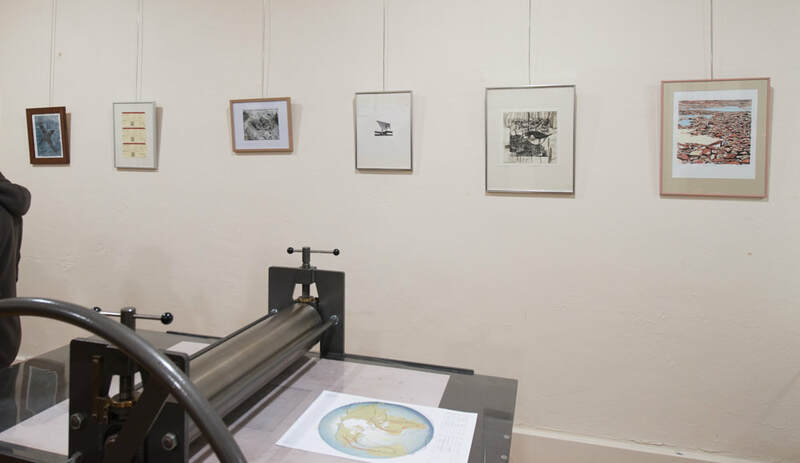 This was the first 'Core' Overwintering exhibition, or exhibition to include all the prints of the Overwintering Project Print Portfolio to date. 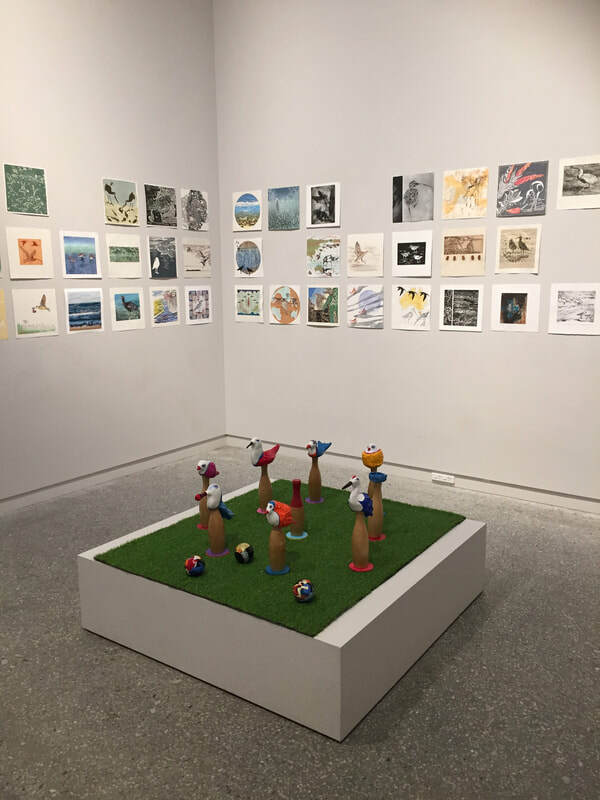 The exhibition featured 157 Portfolio prints by artists from every state and territory in Australia (except the ACT) as well as two from New Zealand. 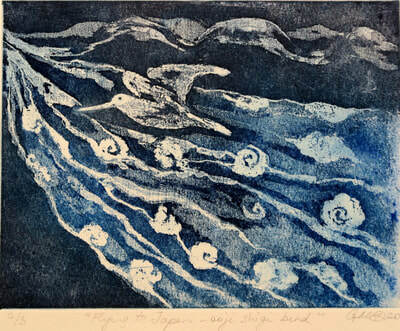 This stunning array of prints - in every medium - was augmented by a variety of other works by the following artists: Martin King (printmaking, Vic. ), Cathryn Vasseleu (video; NT), Sophie Carnell (gold and silversmithing; Tas. ), Fernando do Campo (video; NSW), Helen Kocis Edwards (installation; Vic. ), Andrej Kocis(photography; Vic. 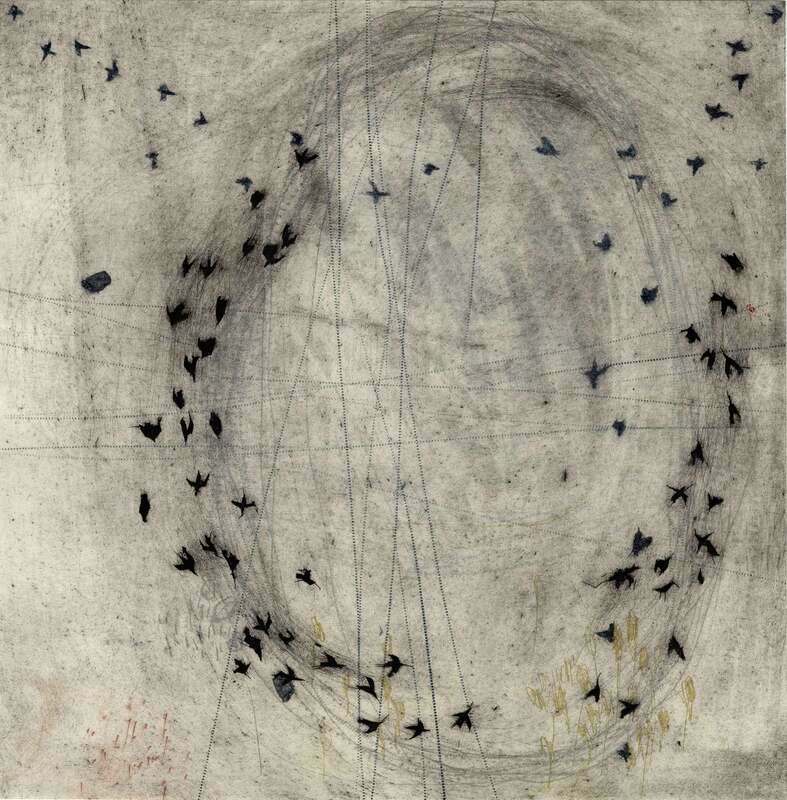 ), Heather Hesterman (printmaking & installation; Vic. ), Deb Mostert (sculpture; Qld), Alexis Beckett (installation; Vic. ), Pamela See (paper cutting; Old), Perdita Phillips (print installation; WA) and me, Kate Gorringe-Smith (printmaking; Vic.). 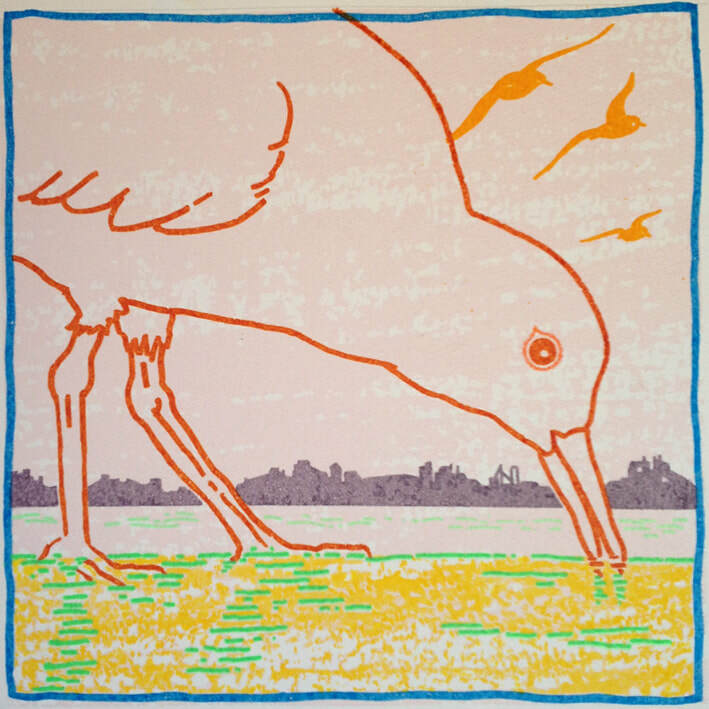 In November 2017, Marine Biologist and Ornithologist Richard Chamberlain came to talk to the Warrnambool Printmakers to help spark work on an Overwintering Project exhibition. Warrnambool, on the se coast of Victoria, is home to numerous migratory shorebirds. The small nearby town of Port Fairy is also home to Latham's Snipe, and the Latham's Snipe Project which was initiated to better understand the ecology and habitat use of Latham’s snipe (Gallinago hardwickii), a shorebird species that breeds in Japan and overwinters in Australia. 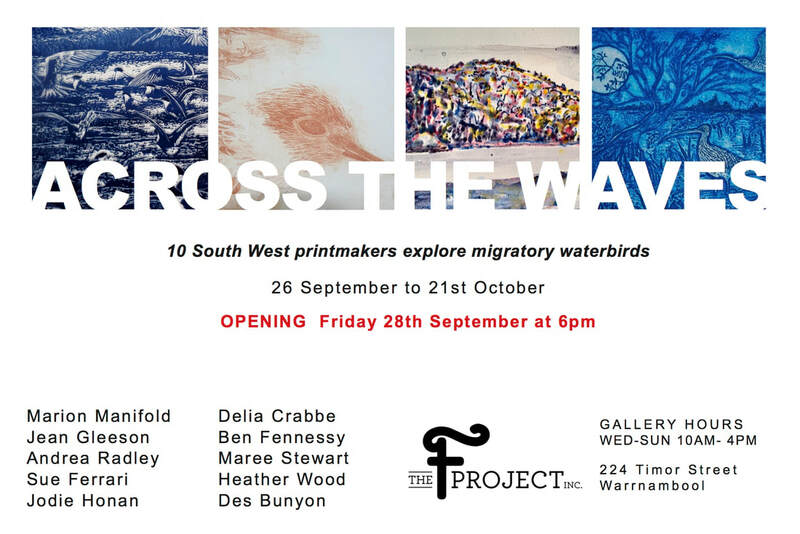 Ten artists joined together for this beautiful exhibition highlighting the local environment. Below: Andrea Radley, 2018, The Visitor. 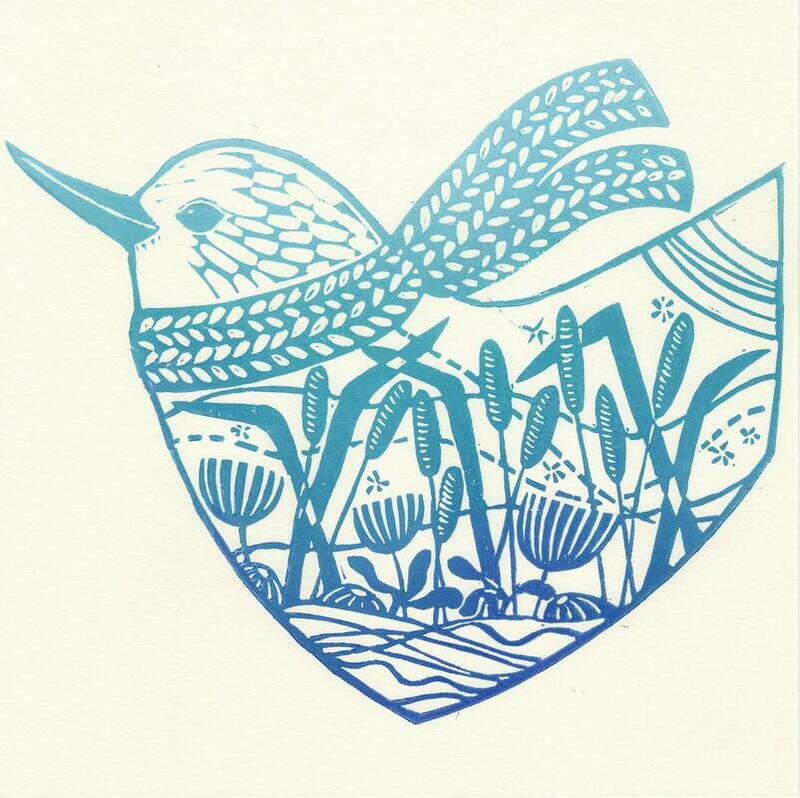 Presented by Printmakers of Southern Sydney and featuring work by Yvonne Daly, Nicole Low, Georgia Lambropoulos, Stephanie McCready, Suzanne Newton, Julianne Smart, Kim Whitbread and Naomi Woodlands. 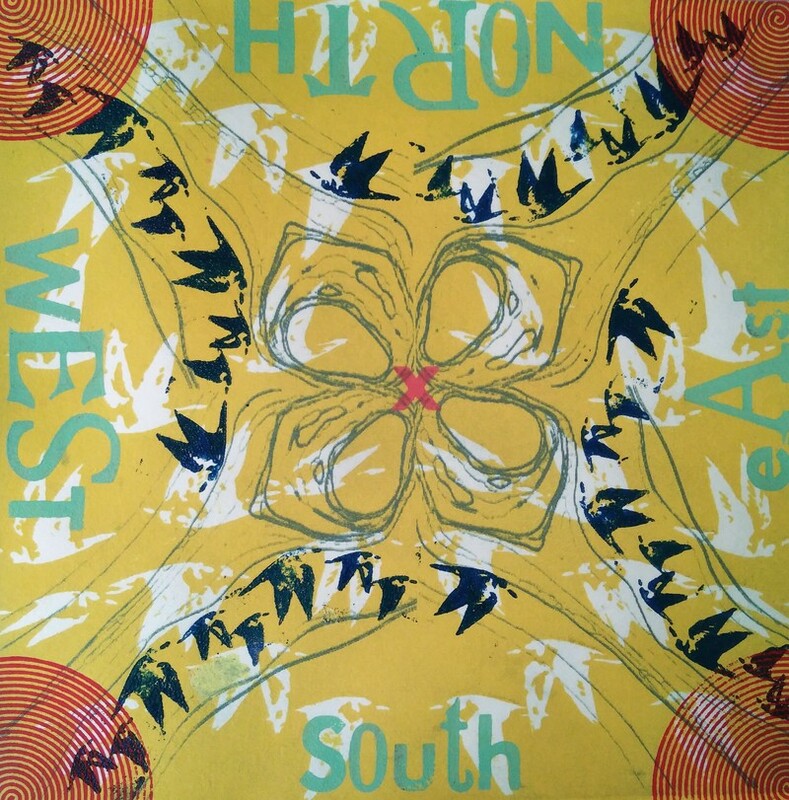 The artists connected with each other through the Hazelhurst Printmaking Program under the tutelage of renowned printmaker, Laura Stark. They are all avid users of the Southern Sydney waterways listing activities like paddle boarding, outrigging canoeing, boating, swimming, walking and bird watching as some of their leisure pursuits. As residents of the local area, the change in the landscape from development and population growth has not been lost on them. From the outset, the group wanted to ensure there was a strong community link to their art exhibition. 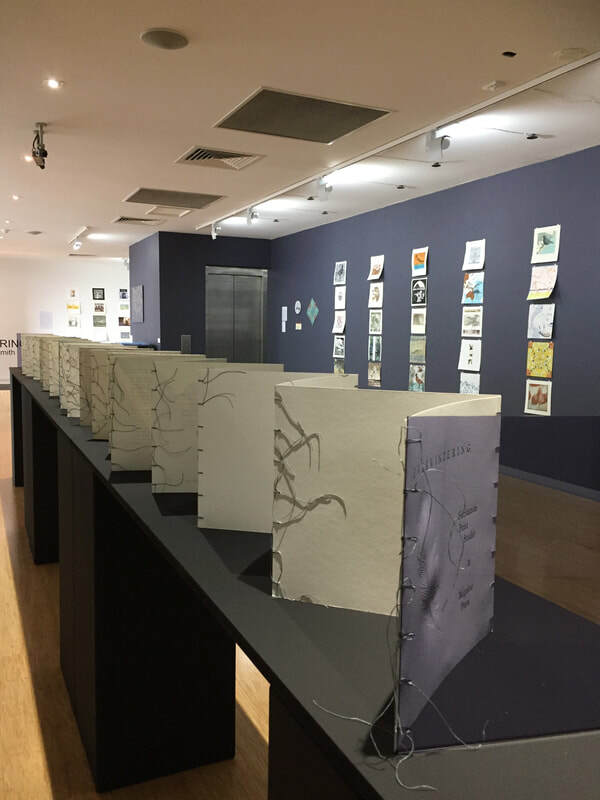 They therefore developed educational projects in collaboration with Sutherland Council, ANSTO and a local school to complement the printmaking exhibition. 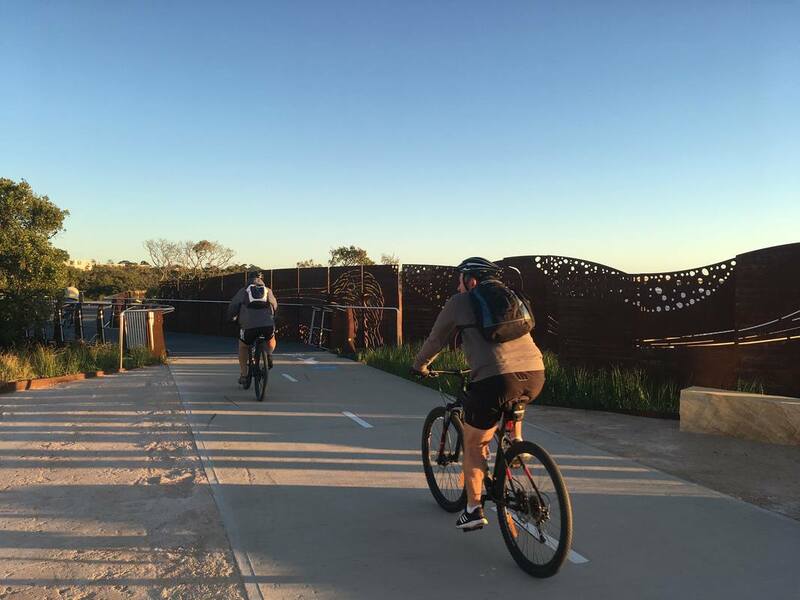 In April 2018, Sutherland Council opened the Woolooware Bay Shared Pathway Stage 6 along Botany Bay. 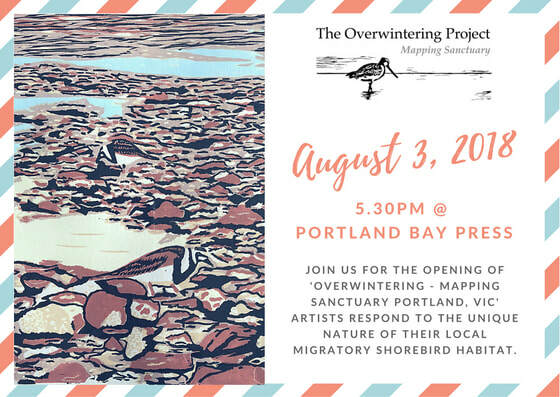 This high profile project featured in the Overwintering Exhibition as an example of how local Council is working to protect shorebird habitats whilst addressing the community’s need for recreational space. 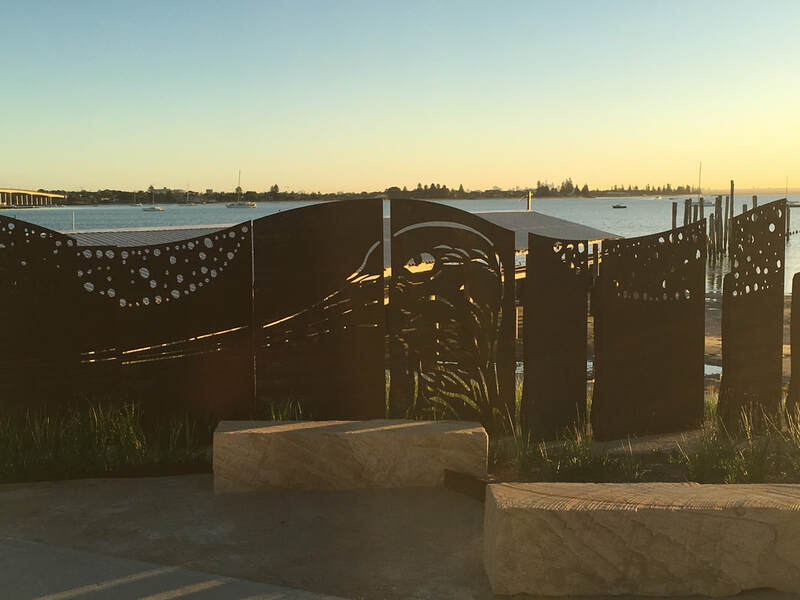 One of the striking features of the pathway is the bird hide, a cleverly designed steel screen which screens users from the east while allowing views of the bay from the west. 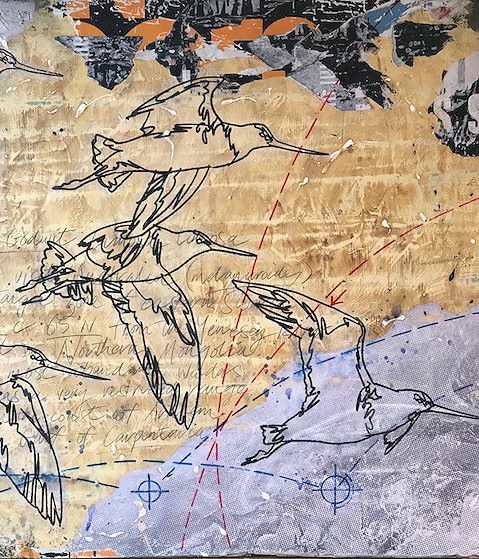 It features a contemporary artwork of the significant birds inhabiting the site surrounded by mangrove seeds washed up on the beach to reinforce the purpose of the bird hide and other sensitive ecologies within the site. Sight holes, provided by the perforations in the screens allows people to view shorebirds without disturbance. Sutherland Council was very supportive of our desire to raise awareness of the plight of migratory shorebirds. 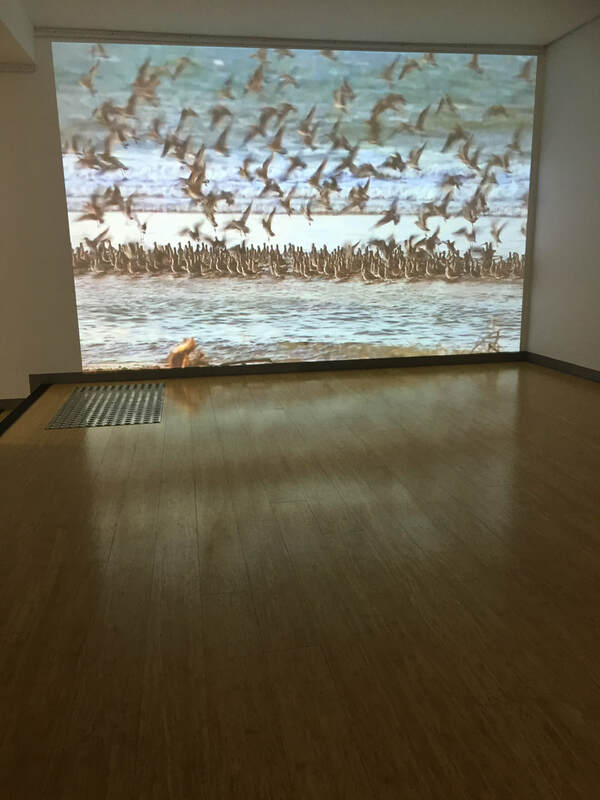 They provided signage graphics for our educational display, sandbag skins so we could create an “island” for our flock installation and the graphic to recreate the shorebird image from the bird hide onto the gallery wall. Brendon Graham, Senior Natural Areas Manager kindly offered to host a tour of the Woolooware Bay Shared Pathway during our exhibition. 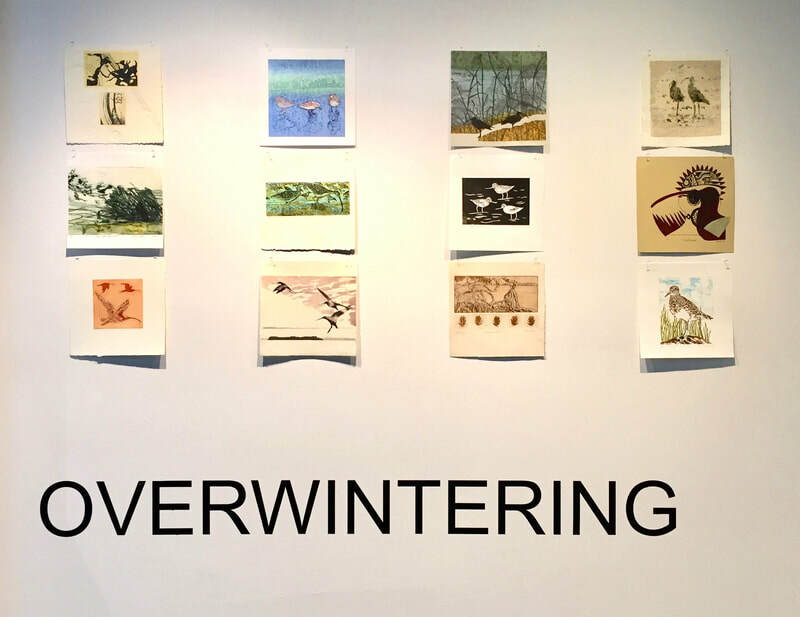 Hazelhurst Arts Centre set up a webpage for the Overwintering Exhibition and a link to book into the walking tour. You can read more about the Woolooware Bay Shared Pathway here. 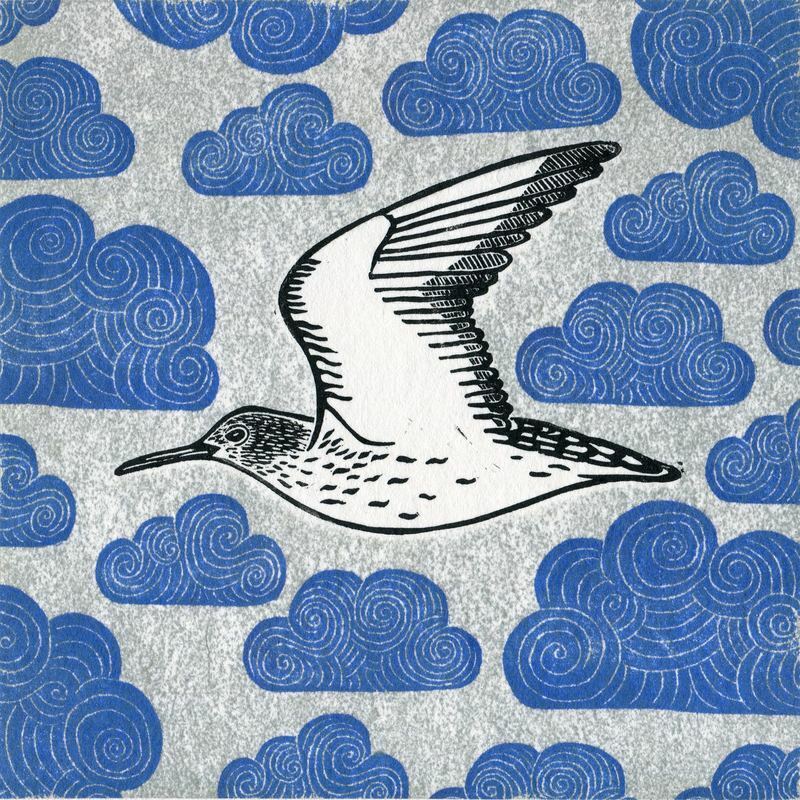 R: The Woolaware Bay shared pathway, and a detail of the bird hide featuring the head of a Bar-tailed Godwit surrounded by the shapes of mangrove pods. 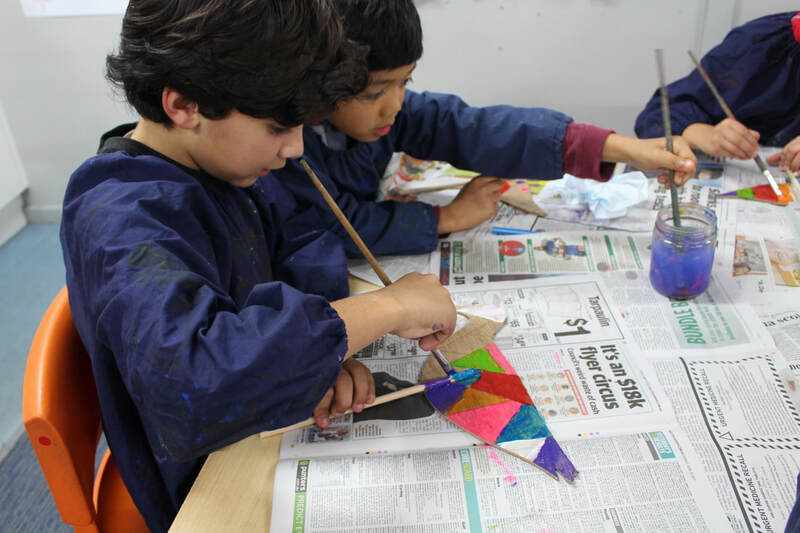 Below: Students from St George Christian School painting The Flock; SGCS Year 3 class reading The Circle by Jeannie Baker. 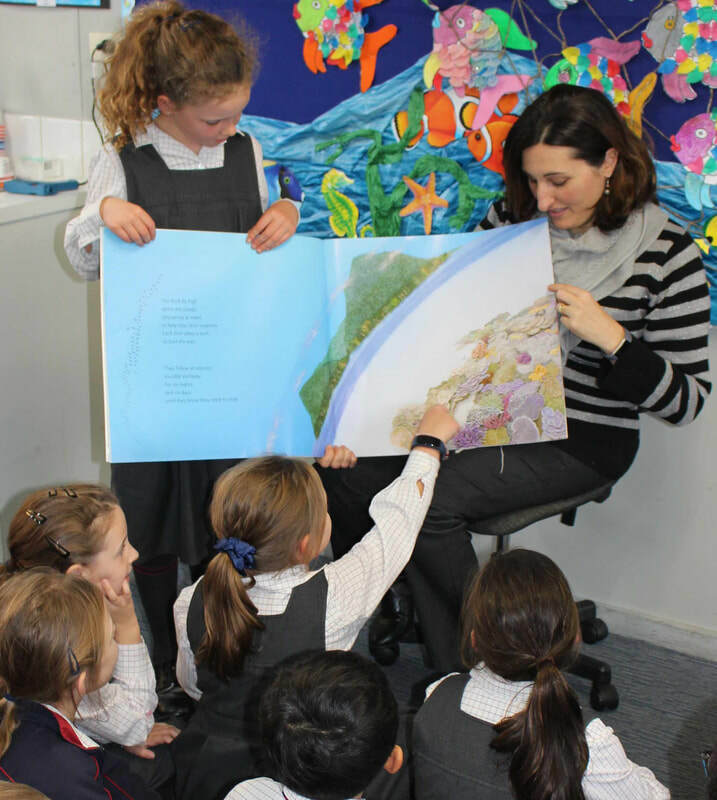 The Australian Curriculum places emphasis on sustainability as a priority for study that connects and relates relevant aspects of content across learning areas and subjects. 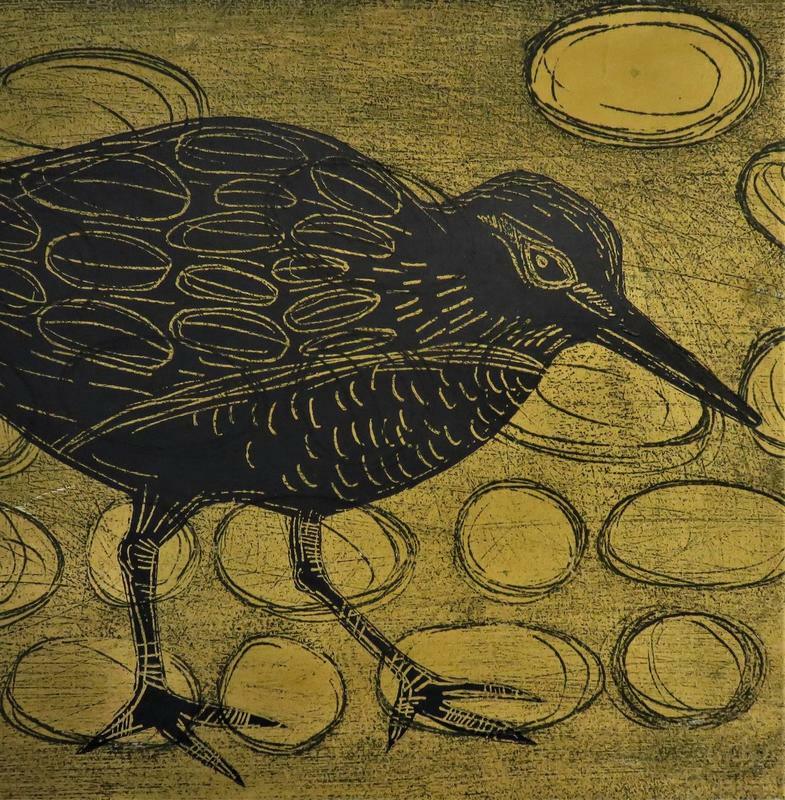 One of the Overwintering artists, Suzanne Newton, worked with teachers at a local school to incorporate a shorebird art activity into a unit of study. 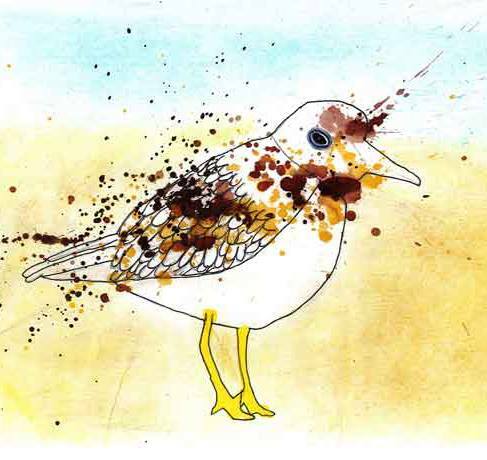 During Term 2, Year 3 students at St George Christian School completed an educational unit in English and Visual Arts with a focus on conservation and the protection of migratory shorebirds. The students undertook speaking, listening, reading and writing tasks in response to the acclaimed picture book, Circle by Jeannie Baker. 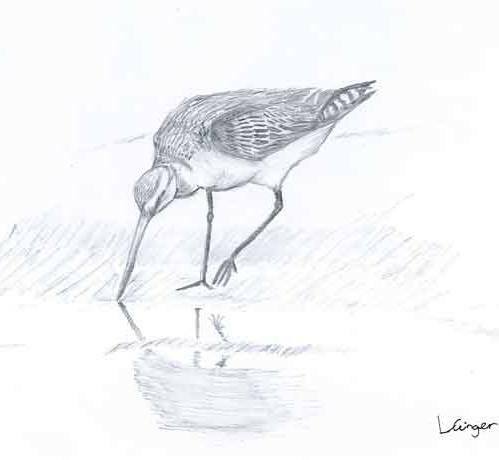 The book tells the story of the migratory journey of the Bar-Tailed Godwit. The Year 3 students also created their own Flock of timber shorebirds. 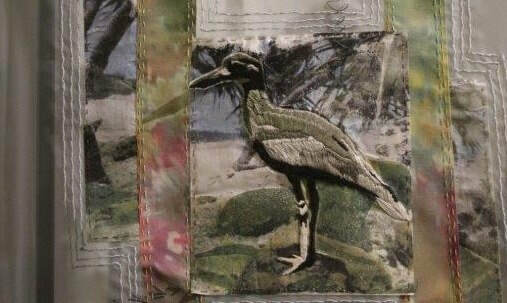 These cutouts were supplied by the Overwintering artists and are based on Flock Oz templates from the Pukorokoro Miranda Shorebird Centre in New Zealand. The teachers took the project a step further with each student adorning their shorebird with paint and an element of rubbish such as twine, fishing line, plastic straws and lids. These items represented the impact of humans on the shorebird habitats and gave the students pause to consider ways in which their own habits can affect the environment. It is hoped that the Flock Oz project will form a regular part of the year 3 unit of study in years to come. The Year 3 students flock will nest at the Hazelhurst Gallery during The Overwintering Project: Bound for Botany Bay exhibition. A story regarding the project was featured in the local newspaper, The Leader. One of the Overwintering artists, Stephanie McCready, who works for the government science organisation ANSTO, organised with ANSTO's support an environmental awareness art competition for primary school students. 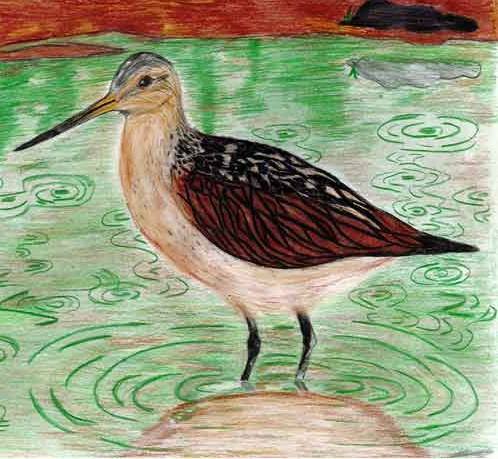 The competition aimed to encourage students to learn more about shorebirds and their local habitats. ANSTO generously offered more that $3000 worth of educational resources as prizes. We extended the closing date to October 26 (originally it was September 28) to give more time for schools to respond. We only expected a small response, but had 26 schools participating, far more than expected! ...At some schools only one class participated and at other schools all classes participated in the competition! One school even took all their students through our exhibition at Hazelhurst Gallery for inspiration! We received 200 entries in total. I was really blown away by some of the entries. The standard was so high and it was clear that the kids enjoyed the activity and put their heart into it. It was such a privilege to receive the packages each week (like Christmas had come early!) and it really warmed my heart! I received lots of positive comments from teachers as well. I decided that I couldn't be responsible for judging the competition myself, so advertised for assistants. Julianne Smart, and two representatives from the Sutherland Shire council came to ANSTO to assist. I also put a call-out across the site, and got 26 judges in total! The competition originally advertised prizes for 1st and 2nd place for Stage 2 (Years 3-4) and Stage 3 (Years 5-6). As the standard was high, we created a 'highly Commended' category as well. Winning entries can be seen on the ANSTO webpage and Facebook page. Below L: Stage 2 Highly Commended; Caleb Summers Class 3/4M Yarrawah Public School; Centre: Stage 3 Highly Commended; Lachlan Ginger Class 6L Oxford Falls Grammar School; R: Stage 3 Highly Commended, Sierra Truong Class 5/6M Peakhurst South Public School. 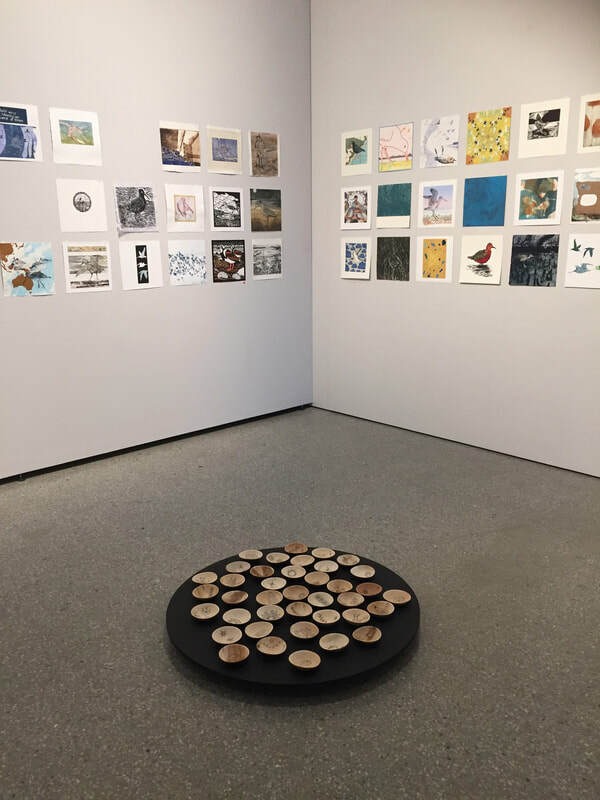 The timing of our Overwintering Exhibition was fortuitous as it coincided with several national and international environmental awareness “days”. 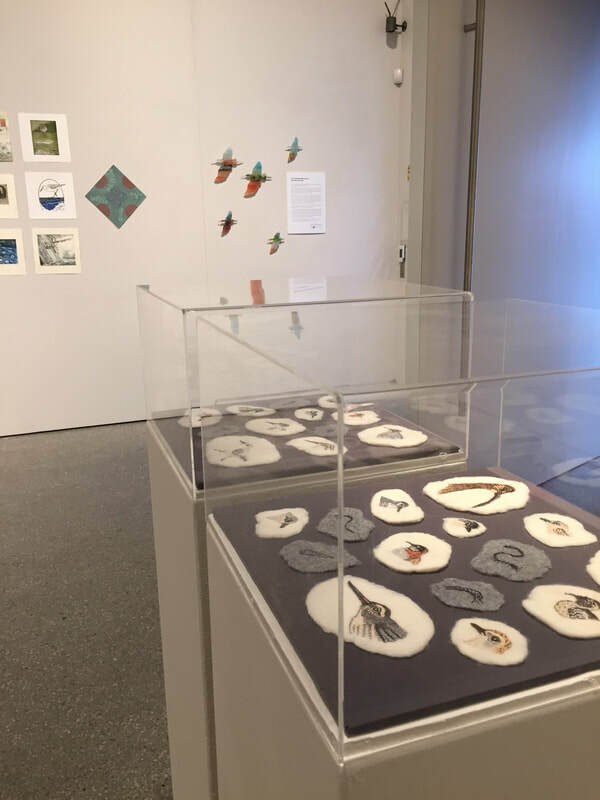 One of our Overwintering artists, Julianne Smart, worked on promoting the Overwintering Exhibition by linking online to various environmental awareness programs like World Shorebird Day, Saving our Species Day and Threatened Species Day. We were also very fortunate to have Phil Straw, Vice Chairman of the Australasian Wader Studies Group of Birdlife Australia give the Opening Address for The Overwintering Project: Bound for Botany Bay. He also delivered a multi-media presentation at the Hazelhurst Arts Centre throughout the afternoon of the Opening. The Overwintering Project has been an exciting experience for the artists involved. It has offered an opportunity to marry our art practice with environmental concerns and work towards social change. 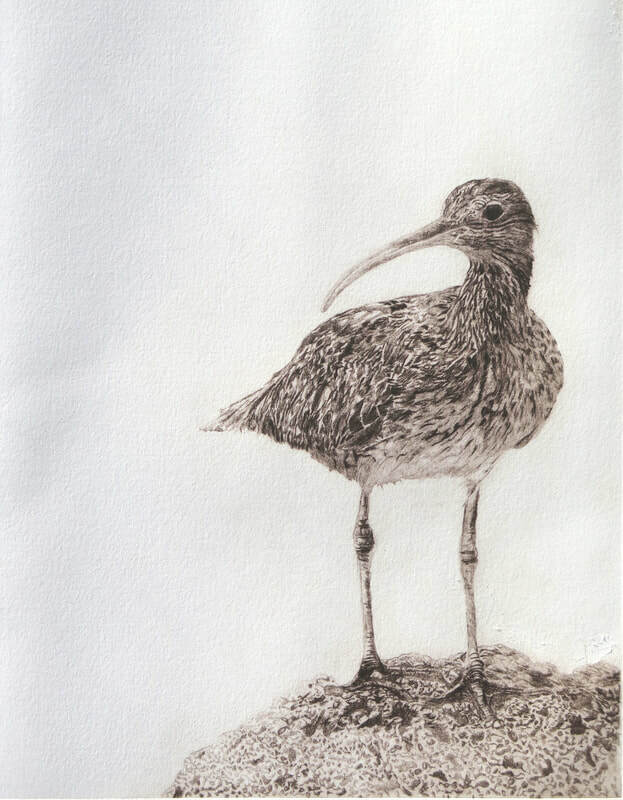 We have been overwhelmed by the number of people that have offered support for the exhibition, demonstrating the depth of feeling for our endangered shorebirds and their habitats. Images below. Top L: Suzanne Newton, 2018, Traveller, solar plate, ink drawing. 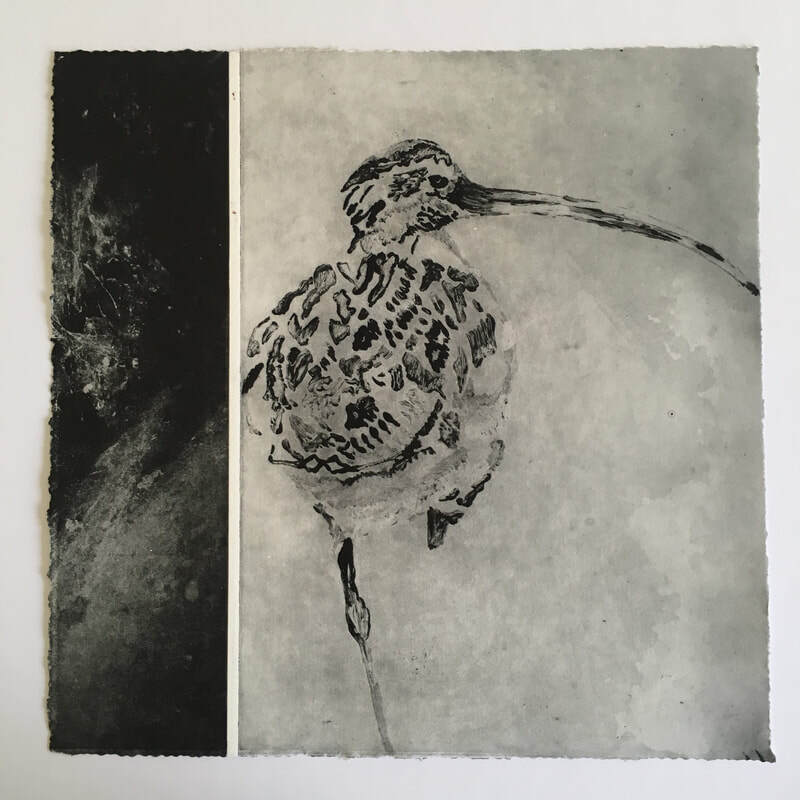 Top R: Stephanie McCready, 2018, Resting, drypoint. 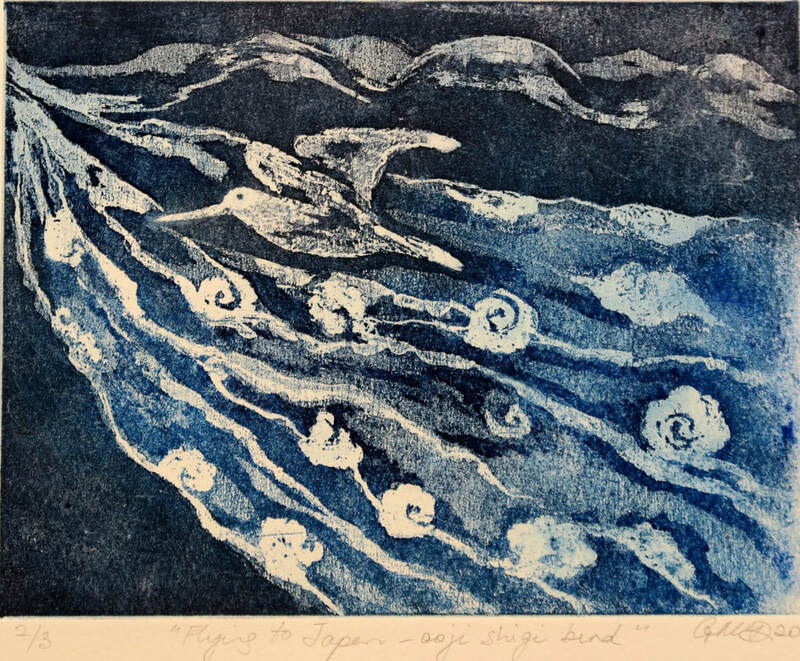 (Image by Stephanie McCready) Middle L: Nicole Low, 2018, Pipe 1, hand-coloured solar plate etching. 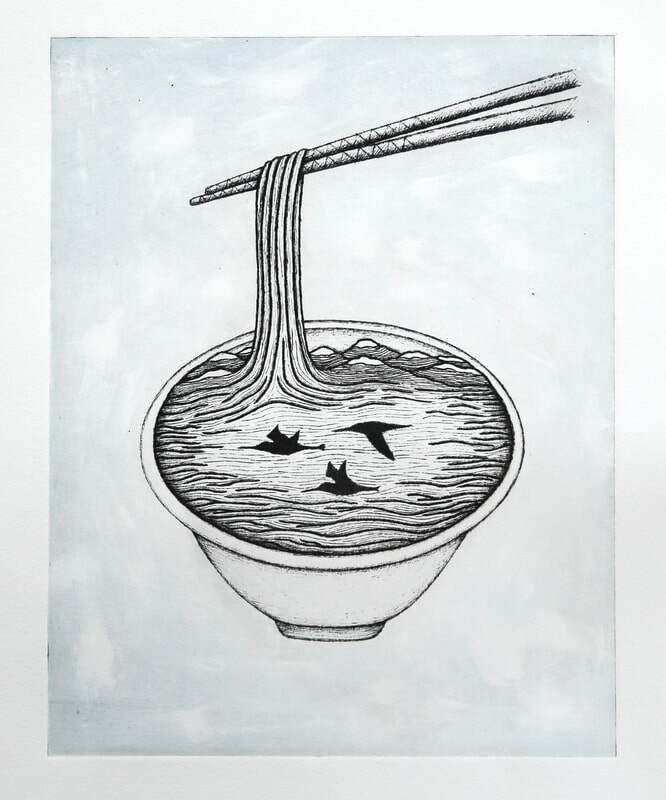 Centre: Nicole Low, 2018, Noodle Bowl, hand-coloured solar plate etching. 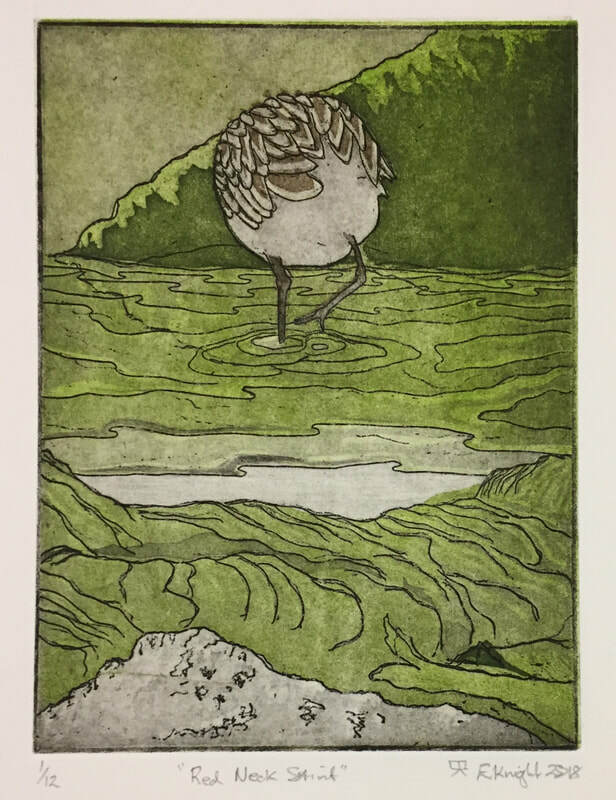 Middle R: Nicole Low, 2018, Shorebird, hand-coloured solar plate etching. 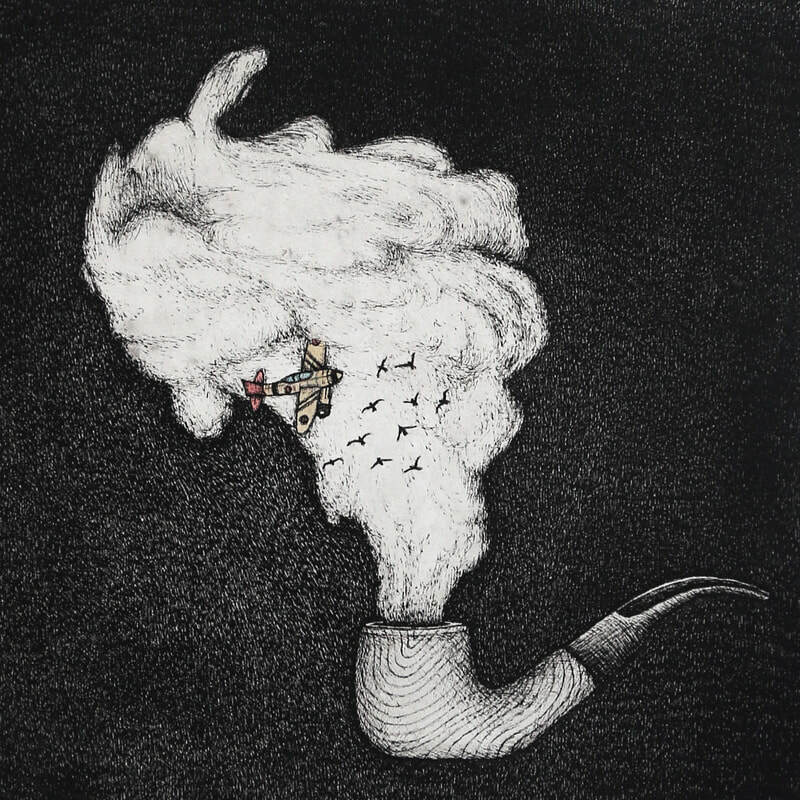 Bottom: Stephanie McCready, 2018, Arrival, drypoint etching a la poupée (Image by Stephanie McCready). Top: Exhibition opening, Portland Bay Press, Julia Street, Portland, Victoria. Images by Gordon Risk. 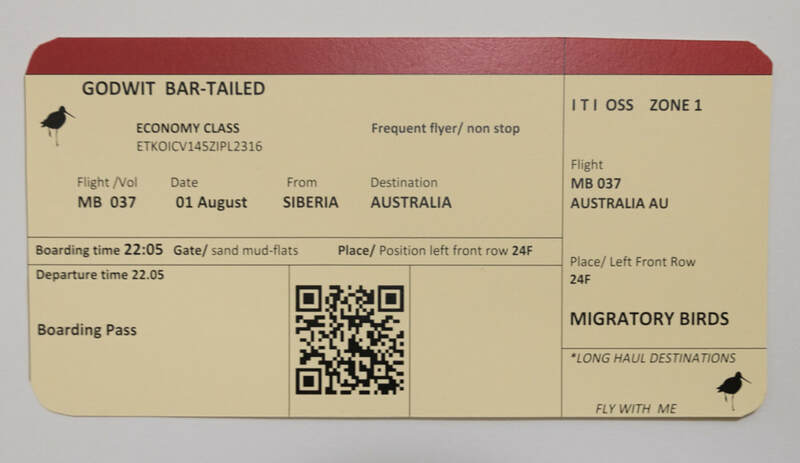 Centre: Therese Coffey, 2018, Boarding Pass, digital print. Image by Gordon Risk. 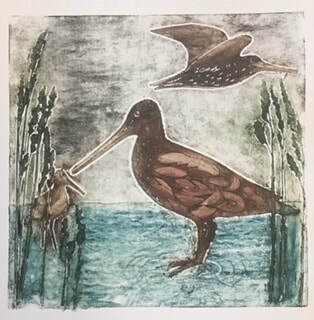 Bottom L: Britt Gow, 2018, Latham’s Snipe at Powling Street Wetlands, Port Fairy, collograph a la poupée. Bottom centre: Elizabeth Knight, 2018, Red-necked Stint, Etching. Bottom R: Therese Coffey, 2018, Bar-tailed Godwit, screenprint. Gina McDonald, President of Newcastle Printmakers' Workshop, wrote: 'On Saturday 23 June Kate Gorringe-Smith arrived to open the Newcastle Printmakers Overwintering Project Exhibition. We were thrilled to have her as she truly has led us on an amazing journey, opening our minds and hearts to the plight of migratory shorebirds that visit Australia each year, to overwinter away from the cold further north to far off places like Siberia. 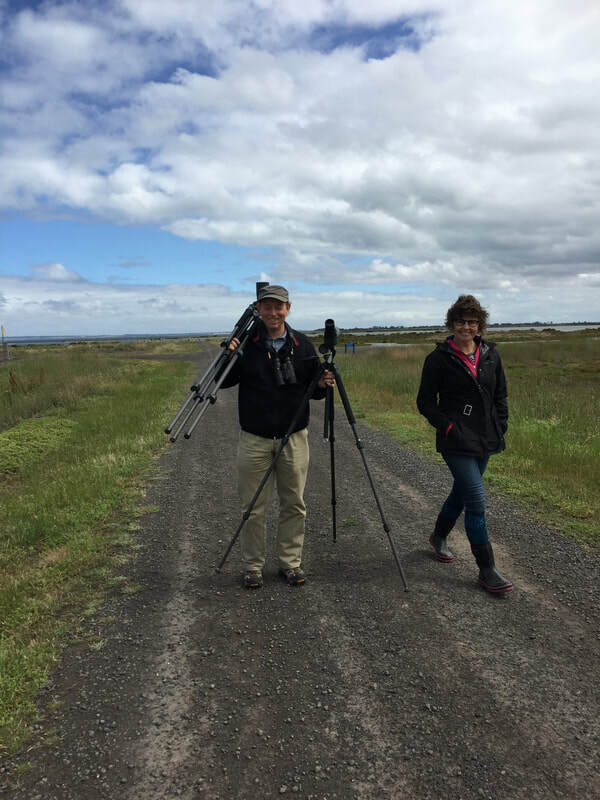 At the opening we were also joined by Tom Clarke and Julianna Ford who accompanied us on our first trip to the Stockton Sandspit where a number of birds like the Bar-Tailed Godwit and the endangered Eastern Curlew gather from September onwards through to May. Some of the birds have decided to stay and Kate was lucky enough to see them early on Sunday morning before she began her flight back home. 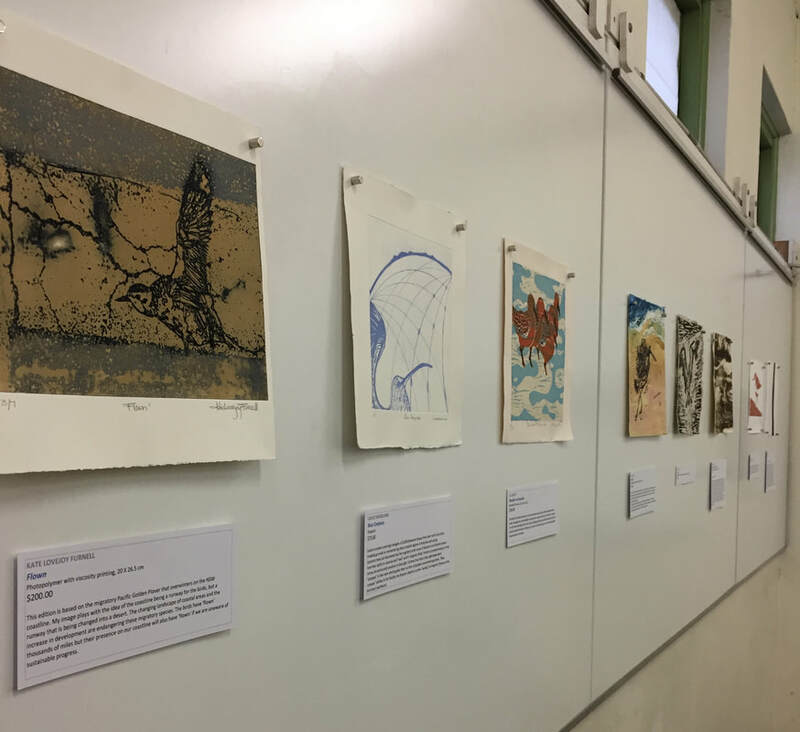 The exhibition was also enlivened on the day of the opening as the workshop hosted a Roaming Art Tour run by Ahn Wells of Gallery 139 whereby participants carved and printed a lino block. Thanks so much to all the members of the workshop who brought the project to life in such an amazing way, and particular thanks to Gina McDonald for all her work in co-ordinating the exhibition! 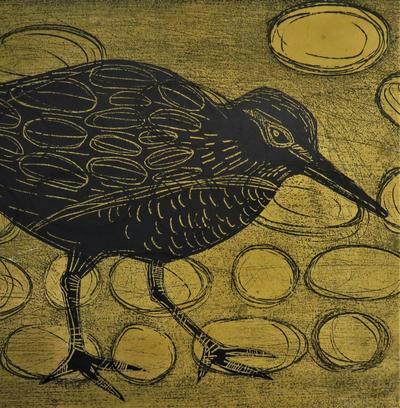 Right:: Exhibition opening, Newcastle Printmakers' Workshop, Sat. June 23. 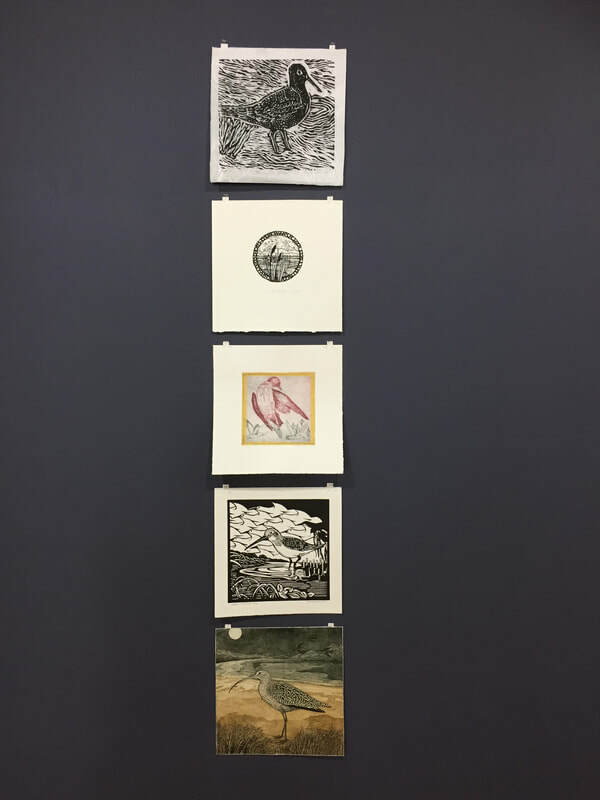 A selection of the works on show include (clockwise from top left): Gina McDonald, 2018, Flying to Japan - the ooji shigi bird, collagraph; Valé Zakarauskas, 2018, Wandering Tattler Foraging, multiplate aluminium etching with intaglio/relief; Anne-Maree Hunter, 2018, In the Shadow of Nobbys, dry point, linocut, hand-stamped text and image, printed in thermographic ink; Robin Hundt, 2018, Lunch at Last, screenprint and pencil. 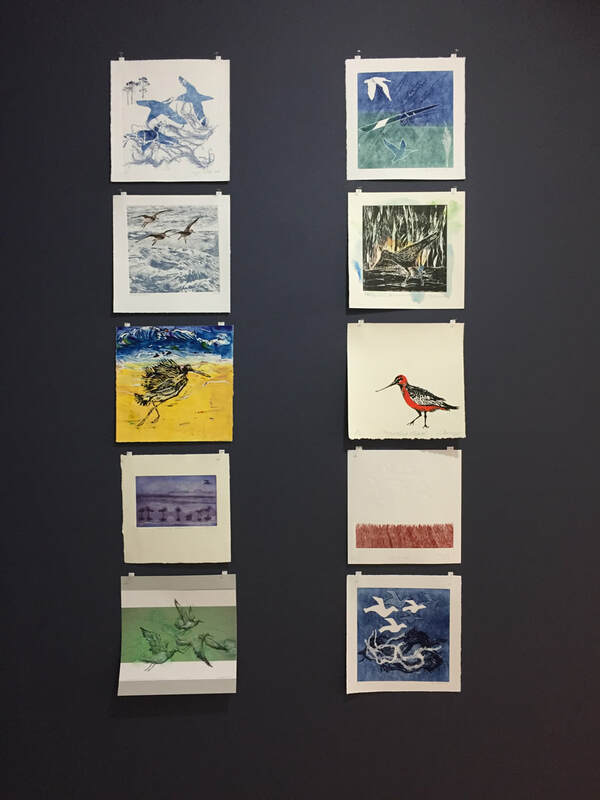 Members of the Warringah Printmakers Studio in Manly Vale, Sydney, exhibited their Overwintering prints in a lovely exhibition held in June in their Studio Gallery. The opening was well attended, and the prints are diverse and beautiful. 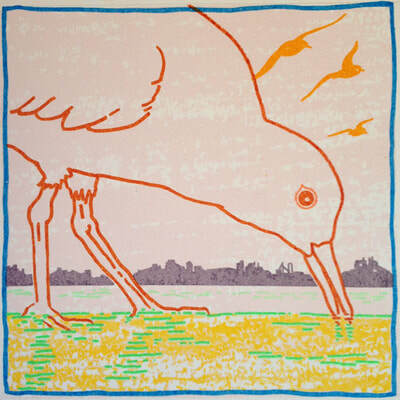 The prints resulted from members' research into their local shorebirds and shorebird habitat, notably a group visit to Long Reef with BirdLife Australia member Robert Griffin. 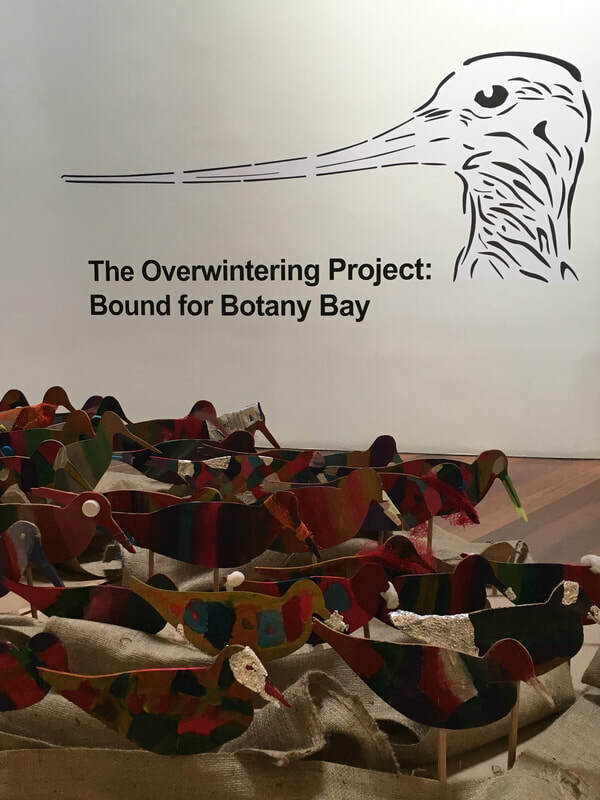 Thanks go to all the artists who participated in this lovely exhibition, but especially to Sandra Williams who co-ordinated Warringah's amazing and wholehearted response to the Overwintering Project. Top left and right: installation view in the Warringah Printmakers Studio Gallery. 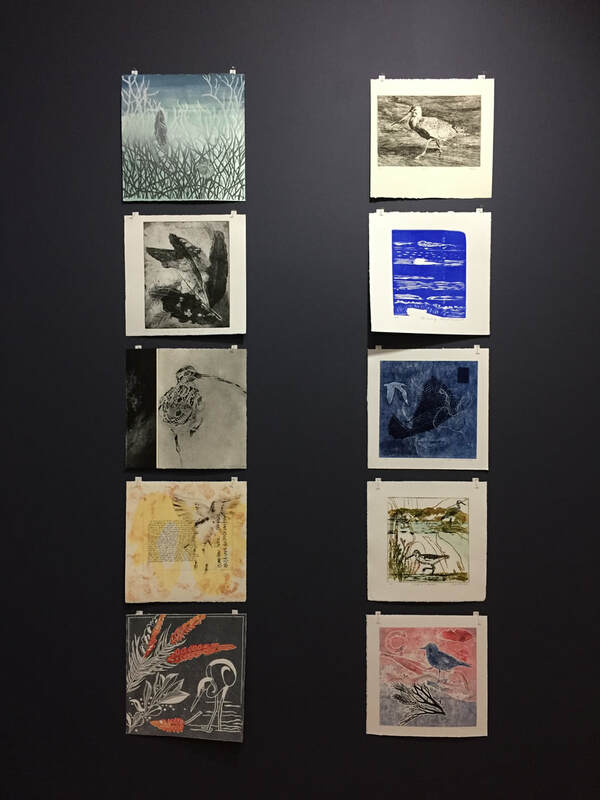 Bottom left: Avrille Ciccone, 2018, Flight of the Godwits, photopolymer etching, a la poupée. Bottom right: Negin Maddock, 2018, In Transit, linocut, stamping and monoprint. 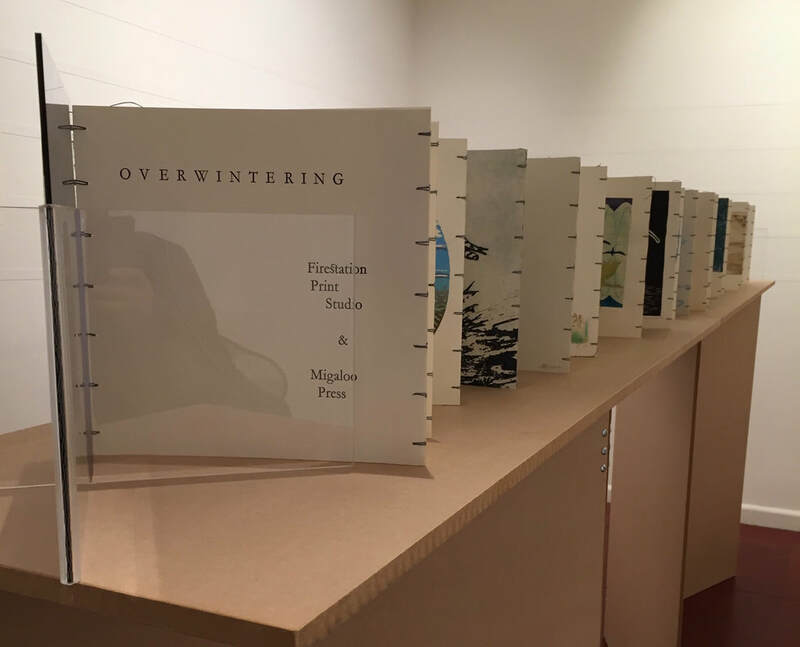 Above: Exhibition images featuring artists' works on the walls and the amazing collaborative artists' book, Overwintering, bound by Migaloo Press members Sue Poggioli and Jennifer Stuerzl. 'Firestation Print Studio decided to join forces with Migaloo Press to help promote the importance of the plight of the migratory birds within the larger Overwintering Project. 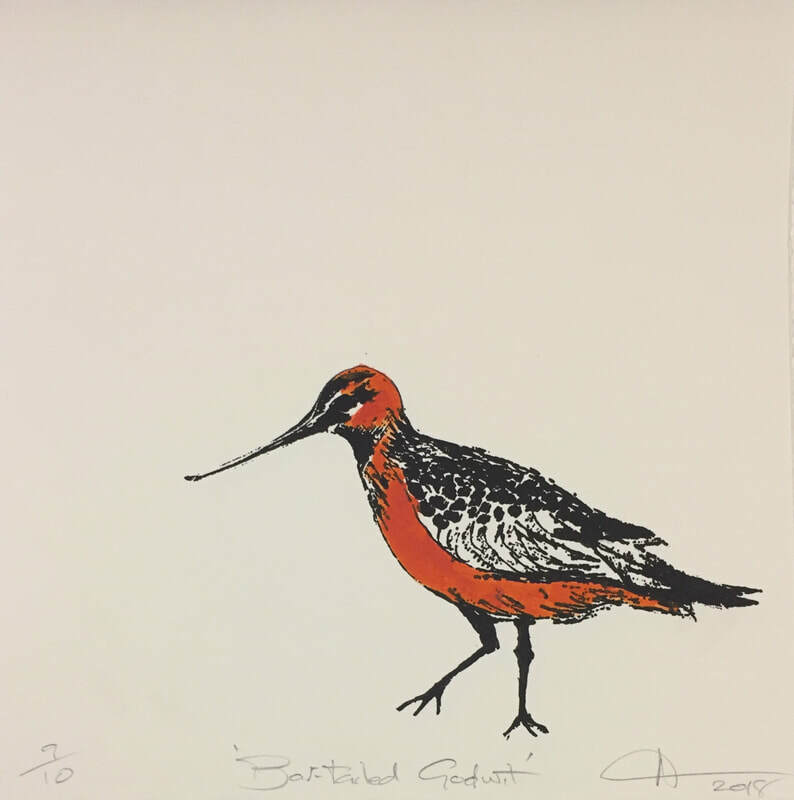 This collaboration brings together two very different ecological habitat, both with significant migratory bird populations' (Overwintering - Firestation Print Studio & Migaloo Press catalogue). 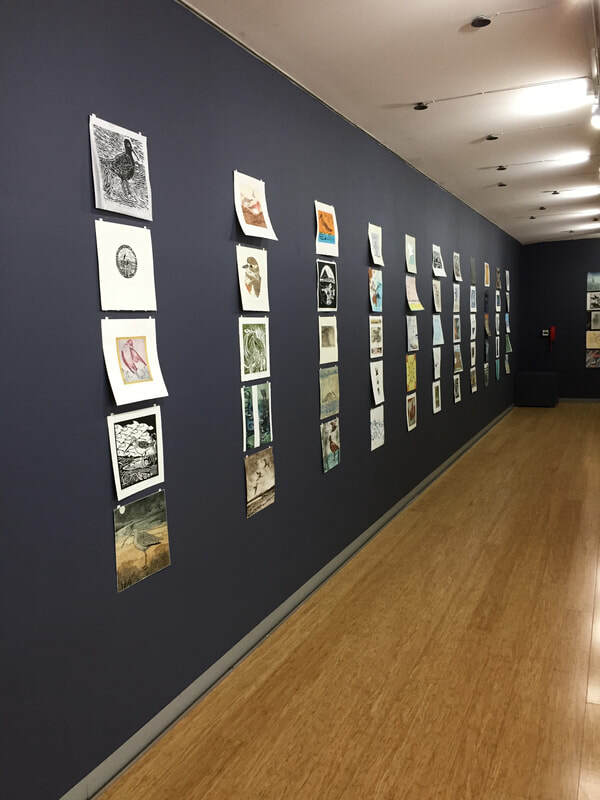 This beautiful exhibition featured a wonderful array of prints by 32 artists from the Firestation Print Studio in Melbourne and Migaloo Press in Brisbane. The prints themselves were superb, but the exhibition was made particularly special by its unique central feature - a concertina artists' book of all 32 prints, hand-bound by Migaloo artists Jennifer Stuerzl and Sue Poggioli. The book, which features a title page featuring letterpress by Marian Crawford, was displayed on a custom-made plinth, made by John Hinds, and took central place in the gallery. The concertina nature of the binding allows viewers to see the backs of the prints where the artists statements (including maps and poems) can be examined. 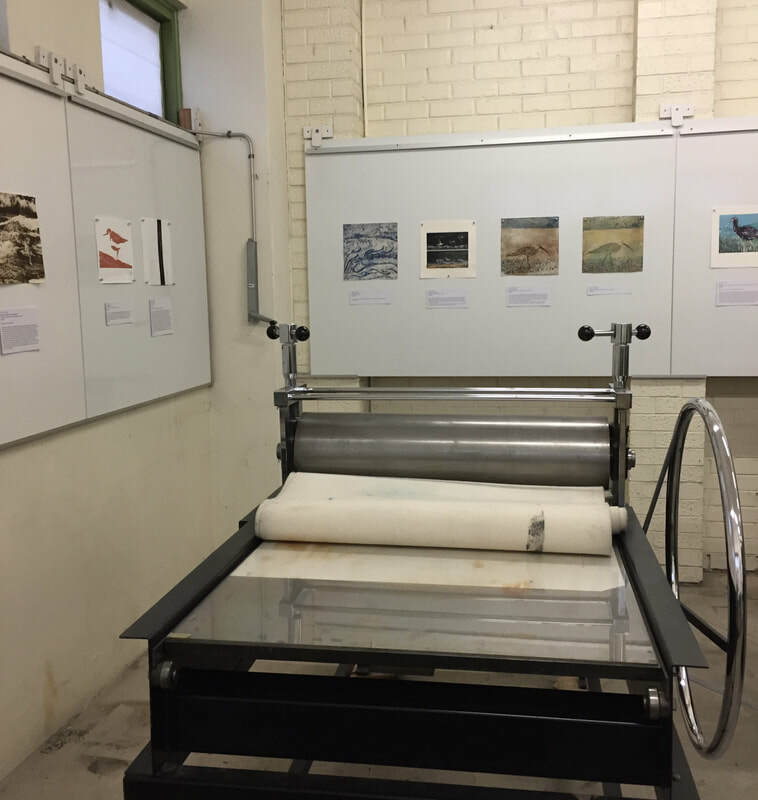 Thanks go to all the artists involved, but particularly to the organisers for envisaging this very special iteration of the project, Edith May from the Firestation Print Studio, and Jennifer Stuerzl and Sue Poggioli of Migaloo Press. Clockwise from top left: Jen Conde, 2017, Eastern Curlew, etching; Peter Ward, 2017, Storm over the Connewarre Wetlands, multiple linocut; Jan Liesfield, 2017, Dreaming of Warmer Climes, linocut; Gwenn Tasker, 2017, 5 inches, 30 grammes, 25,000 km, collograph and etching. Below: Overwintering. Image of whole book by Karen Neal.